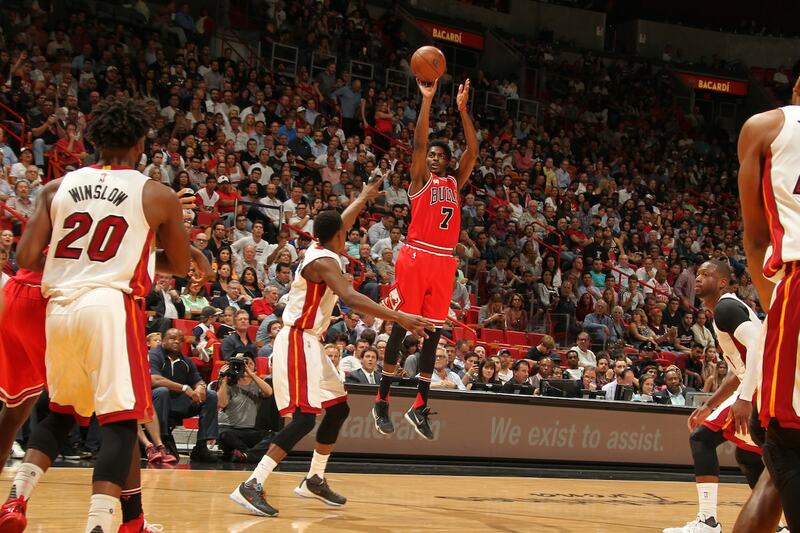 Justin Holiday officially signed with the Bulls Tuesday, returning back after playing for the Knicks. For Justin Holiday it was, perhaps, the road less favored to the NBA. Undrafted, tours of Europe with teams in Hungary and Belgium, a couple of stays in the D-league, three times released, sent to New York last year in the Derrick Rose trade. But it was also the road that Holiday believes was his destiny to make him the tough, hard working, committed player who didn’t surrender. It may be a model for the Bulls. It’s paid off as Holiday steps in as a veteran, athletic presence on the young, rebuilding Bulls. The 6-6 swingman officially is back with the Bulls, owner of the first substantial contract of his basketball life, two years guaranteed. The Bulls Tuesday officially announced his signing. Terms were not released, according to team policy, though published reports estimated the contract for two years at $9 million. Holiday’s combined NBA earnings in stints with the Warriors, 76ers, Hawks, Knicks and Bulls was said to total less than $3 million. “I look back and see where I came from and see where I am and I'm just thankful,” Holiday said in a conference call with reporters Tuesday. “I'm blessed to be in this situation that I am in now. The one thing that does feel good to have especially with the career I've had is to be wanted somewhere and for Chicago to want me, and even other teams. To be able to get to that point and know that you've worked hard to get there, it is a great feeling. But at the same time, I guess because of everything I've been through, I know I'm not done yet. I don't think I'll ever be satisfied as a basketball player. “There's a certain fire I have because of all the things I've gone through,” Holiday explained. “Regardless of me being stable somewhere and being in a place I want to be in, that fire will never leave me. So I do know that I'm going to give my all every time I'm on the floor because I have been on the other side. I know what it's like not to be in the NBA. So I would never take that for granted. I'm thankful, obviously, to be where I am. But at the same time to go through all that. I'm where I want to be in the NBA, but at the same time, I'm a certain person and I'm a certain man because of all that stuff I've gone through." Holiday’s more famous younger brother, Jrue, was the first round draft pick, recently signing a $125 million contract to return to the New Orleans Pelicans. Justin faced the struggle. He played at the U. of Washington as a defensive specialist, a wiry, long armed defender and role player. Playing as a senior with Celtics star Isaiah Thomas—and we know he doesn’t pass much—Holiday was the PAC-10 Defensive player of the Year. But his career scoring average was less than 10 points, and he slipped through the NBA draft net. He began his pro odyssey in Belgium in 2011, came back for Summer League with the Cavs, went to Portland, the D-League, the 76ers. Summer League again, and again overseas to the not-so-hotbed of basketball in Hungary. It was no holiday. Justin wasn’t taking any vacations from work, however. It was a third Summer League tryout in 2014 with the Warriors and he was around long enough to collect a championship ring. He was gone after the season, scrapping again and hooking on with Atlanta. He looked like an NBA player, but it’s easy to get dismissed these days with the premium on shooting. Justin worked at it, and after going to the Bulls in the Kirk Hinrich trade in February, 2016, Holiday was one of the Bulls’ best three-point shooters at 43 percent. The Knicks wanted him in the Rose trade. He averaged a career high 7.7 points in 20 minutes off the bench and shot 36 percent on threes. But it was back on the market as a free agent this summer, and the Bulls didn’t forget his positive attitude and work ethic. “The free agency process was very short,” Holiday said. “I ended up deciding to come back to Chicago. I knew going into free agency that Chicago was one of the top places I wanted to attend. I enjoyed my time here and how I was treated. Went back and forth with the negotiations and with how the market was and how everything was going. Sometimes you don’t want to risk anything. I knew I wanted to be here. So I made my decision. Everything happens for a reason. I was able to go to New York and have a good season and get back here. “Obviously, it’s a young team,” Holiday said about what he sees with the current Bulls roster. “One thing that I like about young players is they tend to play hard pretty much all the time. One thing I always say as far as picking a team if I had to take guys to play on my team or guys that I enjoy playing with are guys that play hard and give everything they can the whole game, regardless of their talent. I’m a guy who had to work hard to get to where I am. Of course, I’m talented. But a lot of work and sacrifice and giving my all got me to where I am. “I know young guys love to play that way to kind of have to stay in this league. So I’m excited about playing with a team of young players that are able to go hard for a long time. As far as my role, which is kind of weird to say, I think I’m one of the oldest people on the team, which is a first for me. So I guess I can fall into some type of leadership role to help some of the younger guys because I have been through so much. Not saying I’m the main guy or this and that. Just saying I know I can help the young guys especially getting through a season and dealing with certain situations that might not go your way because I have been through so much. As far as on the floor, just be able to play my game and bring what I bring to the table and kind of like how Fred (Hoiberg) allowed me to do that last time I was here. I’m looking forward to that." Justin Holiday endured and came out the other side of the doubts. The Bulls have chosen a road difficult to travel. They have added someone who knows about the bumps and detours and knows the trip can conclude successfully.